Sheffield Council install access barriers on some cycle paths. The intention is usually to prevent motorised vehicles accessing the path. Older barriers tend to be ‘chicane’ style or ‘A’ frames, while newer ones are ‘K’ frame style (below). 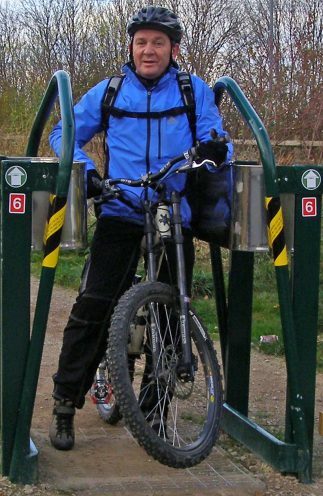 The photo above shows how ‘easy’ it is, from the website of manufacturers of K-barriers (Sheffield City Council’s preferred barrier supplier). Plenty of people and types of cycle can’t do this maneuver. The barriers are not effective at preventing motorbikes and mopeds from accessing cycle paths. The new barriers on the Thoresby Road path (fitted in 2016) can be easily bypassed (also see photo at the top, showing the only way to get a cargo bike, which was funded by SCC, past the barrier) and so appear to have been a token gesture rather than a serious attempt to prevent motor vehicles from accessing the path. New barriers cost around £5000. Given the council’s limited budget for cycling improvements we would much rather this money was spent on better provision to allow more people to cycle rather than making cycle paths less accessible. A better design of barrier? We know of no design in the world which could do the job. Since motorcycles and various types of pedal cycles have similar dimensions, motorcycles cannot be physically prevented without also preventing legitimate cycle users (and inconveniencing everyone). The London Cycle Design Standards (see page 73), recognised as the highest quality standards in the UK, recommends against the use of all barriers, because of the accessibility issues they create. Bollards with a 1.5m gap are the simplest way of preventing access by cars and other larger vehicles. They do not prevent motorbikes, mopeds etc from accessing the paths, however, it is clear that neither do barriers. You should report anti-social behaviour to the police on 101 or online. We have raised the issue with council officers, and Sheffield Council’s cycle champion Councillor Steve Wilson. The only suggestion from the council has been that they could consider replacing chicanes with K barriers, despite the accessibility problems which these still cause. The chicane barriers at both the underpass by Netherthorpe tram stop, and on a bridge over Mosborough, were removed this year by Sheffield council contractors. This was to improve pedestrian flow for the Tramlines festival for the former, and to allow resurfacing of the path for the latter. We asked the council not to replace them afterwards, but they did. We have collected the locations of some known barriers on a map. Sustrans volunteers for the Trans Peninne Trail have also made a map showing the barriers along this route. Please get in touch if you know of others we’ve missed, and share your experiences. Sometimes they just don’t make sense. It appears that Sheffield City Council are so keen on the K barrier brand that they are encouraging developers to fit them to paths by default. This saves the council from paying for them later, but means they’re placed without any existence of motorbike issues… or apparently much understanding of what the barrier is even meant to do! However, I think you could allow access to *most* cycles, while denying access to *most* motorbikes, by simply paying attention to handlebar width. If the gap was made to be *consistently* somewhere between 65-70cm, the standard(ish) 60cm bar found on hybrids and older mountain bikes would fit just fine. Some of the more extreme ‘jump’ or downhill bikes might have a problem but I’m going to assume anyone riding such a bike is reasonably fit and able-bodied – enough to hold the wheel off the ground with the bars turned and shuffle through like I somethimes have to anyway. A standard width trail mountain bike handlebar is now around 760mm. They’ve generally got a lot wider as they’re thought to give more control. I also used to find these barriers restricted me as a pedestrian when I carried my child in a backpack. The narrow width at the top doesn’t take sticking our legs and small wellies into account. They don’t solve anything. If someone wants to ride a motorbike on a routeway illegally they will find a way of gaining access. I don’t know if you still experience access issues like this but if so it would be good to report them to transport@sheffield.gov.uk so that SCC are aware of the problems these barriers cause. Other than real thought of course. And what about the benefits forgone of fewer people cycling or walking thanks to these barriers? My area is plagued by illegal dirt bikes and motorbikes/scooters using the public footpaths. I’d take these barriers in a flash and have petitioned for their installation to no avail. As a cyclist myself I have no issue passing these barriers and as always, the needs of the many outweigh the needs of the few. public footpath users is what it takes to thwart the problem then I’m all for it. The barriers don’t stop dirt bikes, scooters, quad bikes or motor bikes. They are a waste of money and block access for legitimate users. Agree with everything said here. I’ve had to negotiate those bars under Netherthorpe Road many times, and they’re a pain, especially if you have panniers on the bike. Particularly annoying for all if bikes and walkers are trying to pass at the same time.